I want to add a zero to my fuselage for a sim game I'm running. I've added a layer to remove the original number and now want to add another. I really don't want to manually add the rivets manually. Can I add an orange mask to have them shine through? I've tried applying blending to the layer but the as the background has different colours it won't work. Can I set anti-aliasing to use the bottom layer and control strength? It's too sharp. 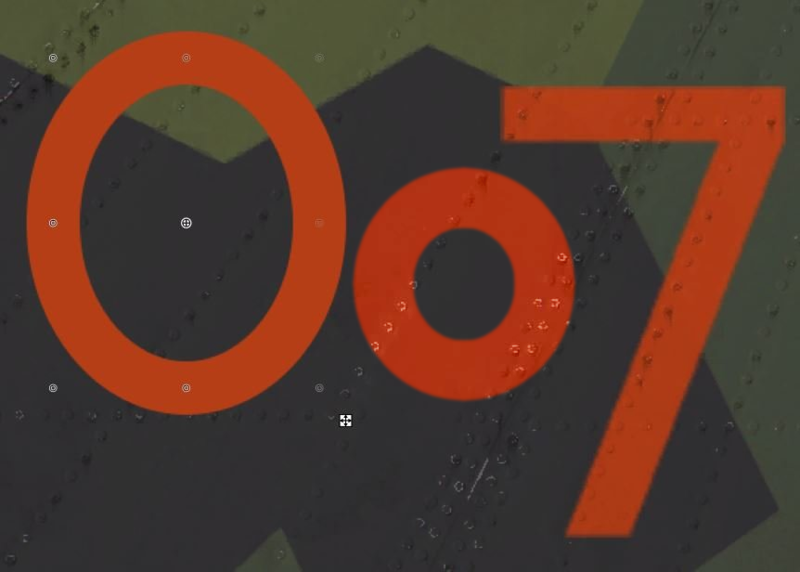 I'd be interested if there was another solution because I can't see how it could be done easily as each rivet needs to take on the new applied (orange colour) where the "0" is positioned. This is theoretical, I've never tried it for anything this critical in terms of colour and texture. What I'd be trying, working on a new copy of the background, recolouring all of it or at least the area over which the "0" is to be applied, to the same orange as the "7" lettering. That won't be easy but get that to look as you want then use the "0" as a cutting template with the Wizard tool and simply cut a "0" out of the recoloured background. 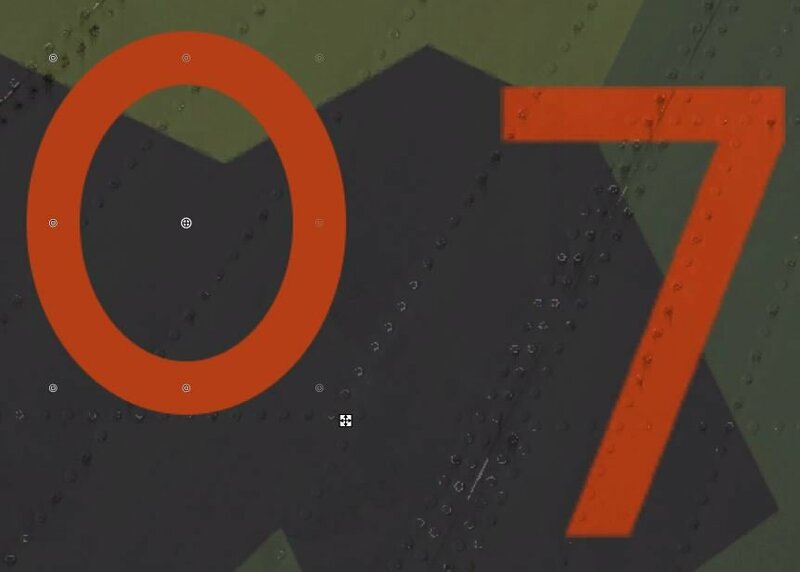 Import that into the original image and paste it in the correct position to match the rivets underneath, maybe add some transparency to blend and use other tweaks to get it to look like the "7". Cutting out/copying lettering never looks as good as cleanly applied original lettering using the Text tool but in this case it might actually help it to match the slightly softer "7". Just had a very quick go using that posted image. For obvious reasons I had to use an area of clear background so the "0" size/shape used was just for that reason. As I thought, the most difficult part is recolouring the existing essentially all grey/greenish rivetted area where the "0" is going to go to match the "7". Using the Color tools I could not get anything that looked acceptable. I then tried a mix of BoltBait's Color Balance, Hue/Saturation, Brightness/Contrast and transparency settings and it looked better but trouble is neither of those first two tools provide for precise RGB information so you have adjust them by eye and test using the color picker afterwards. The colour match after this cursory test was nowhere near what I'd call acceptable. If there is some plugin that can recolour an existing image to exact an RGB colour it might do a better job. The existing Recolor tool swaps colours almost too precisely for this sort of task. Whatever setting I used with the tools employed the rivets' highlights were exaggerated unacceptably too. However the cut out idea did work OK and the Anti-Aliasing Assistant tool cleaned up the slightly ragged edge you get when cutting out curved edges. However to match the look of the "7" I'd suggest using a low setting of BoltBaits Feather Object tool. I'm embarrassed to post this but just take it as a proof of concept. Hopefully somebody else here can come up with a better solution. You could also try the Clone Tool ... better to zoom in for it tho'. Done by Clone Tool on the original '7' then putting the rivets on new layers using the Clone Tool. A bit hit or miss but if you've more patience than me it could be believable. There can be an obvious colouration mismatch between the rivets on the new layers. ".... distorts an image based on the light values of the mask. This is useful for mapping images to other surfaces. " I don't think the problem is the so much the mapping, although that may also be useful for this task, it is the colour matching that is the real issue. If the "0" is going to go where Asken has it in the image provided cutting out a template with textural details ie. the rivets, will also include two very different background colour areas which are of varying tone too. Colour matching the "7" was tricky enough (at least with the tools I used for my crude attempt) just using a template/cut out from the grey painted area. The problem is to apply even orange lettering colour required across the mixed textural and varying colour/tone background. I was thinking about suggesting converting the cut out "0" to b/w, evening out the tones between the two different colour painted areas with a mask or some other technique and then re-colouring that b/w image and/or blending it with a plain orange layer to match the "7". But whether this would work and what blending options would be required to match the orange but not exaggerated or lose things like the rivet highlights is beyond my PDN knowledge. @Jeronar we call that hijacking a thread. As you can see, we have little tolerance for it.